Bougainvillea is declared as the flower of the city since the status upgrading of Ipoh in 1988. The local authorities started to plant more bougainvillea flowers in landscaping along the streets, gardens & recreation parks. This is kind of easy-grow species that also commonly planted in residences; my mom did have many of this in her garden years ago. When I was visiting Ipoh Garden South for the first time in 1986, it’s already a well developed residential area. 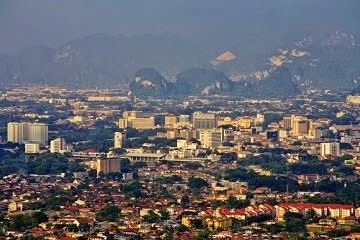 It’s the only residential at that time having a shopping mall, Ipoh Garden Plaza, as seen in the right of this photo. 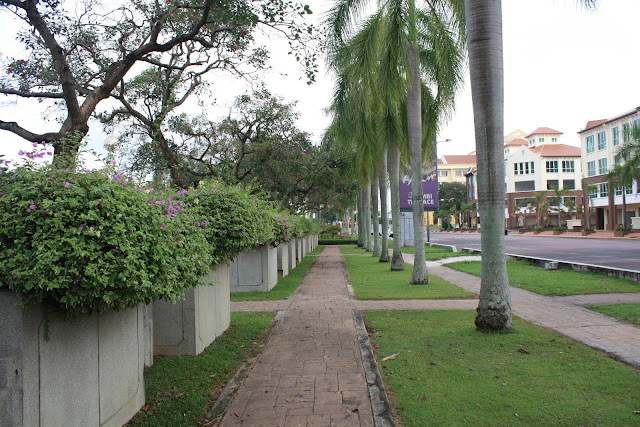 Ipoh Garden East was later established at its northeast as an isolated housing estate. But during the early 1990’s economic booming time, houses were mushrooming at this area & the two estates finally “joined”. From Kinta City, looking south will be the Ipoh Garden South with its landmark buildings, Pantai Hospital & the 8-storey Income Tax Building (Wisma Hasil). 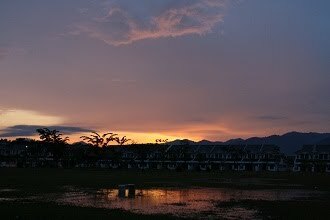 The sunset is captured at a clear sky in the west while it was drizzling at my location. 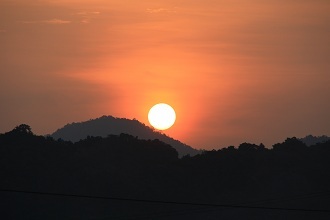 A full round golden sun is seen to be moving down until disappearing behind the tree & hill. This is not a working day. Therefore the traffic in Greentown is smooth & relaxing. During the working days, the surrounding of EPF (Employees Provident Fund) Building would be so congested. One of the reasons is the very limited public parking available in the building compound, while this is a busy department which commonly flooded by crowd. I am wondering the building architect has ever taken the factors of traffic & parking into consideration when designing the building. This is not the only public service building having this mistake but most of the government offices (at least in Ipoh) are not visitor friendly. 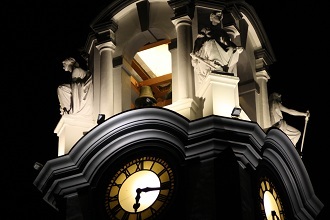 It is encouraged to turn lights off for an hour during Earth Hour. When I was hanging around at the front yard from 8:30pm to 9:30pm, I found not many families at the neighbourhood had their lights off. Standing under the moonlight and streetlight, the night seems peaceful, but the mind was not. The French aroma product, Lampe Berger, is my favourite. It is not only famous with its aroma essential oil but also well known of the artistic & elegant lamp. Some masterpiece could worth the price up to thousands of dollar. I am, of course, not afford to own such a luxury lamp but I managed to get these simpler ones at a reasonable price as my collection. Something unusual appeared above the city this evening. Thick rain clouds that looked like lumps of dark cotton were covering the sky. 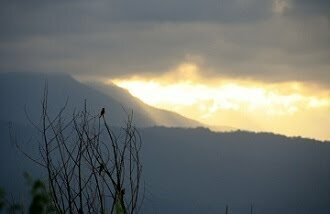 Sunlight penetrates at its wrinkle like the sky would crack into pieces. The clouds were rolling like burning thick smoke, look so similar to the special effect in movie; imagine a giant monster or an alien spaceship could come out from the cloud. Few minutes later, there was no monster or alien falling from sky but only rain. It’s the end of a warm day. The piece of cloud under the sunset appeared to be silky smooth & colourful. It brings the feeling of relax and peaceful. Iron lamppost was the standard street light used in town about 30 years ago. I guess the official colour of city council during that period is orange, because we found orange colour was widely used on items related to the council, such as street fencing, garbage truck, council’s truck, lamppost & even worker’s uniform. The orange lamppost was installed in most of the downtown streets & the trunk roads. 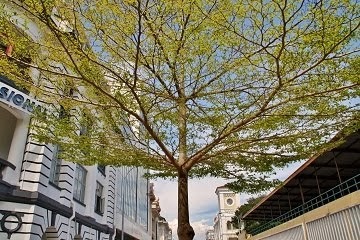 However, it had been replaced by aluminium street light over the years. 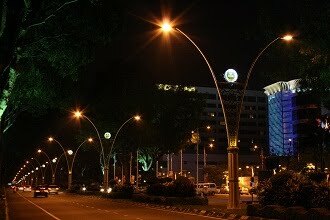 What we are seeing at the junction of Silibin Road & Maxwell Road is probably the last of the orange lamppost in Ipoh. Soon, it will follow the fate of its siblings, to be replaced by new street light in the road upgrading program. Despite there could be some standalone survivors still remain in isolated areas, the orange lamppost has already captured as the city’s history. 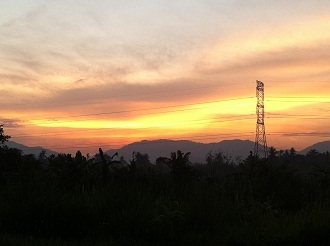 The moment I step out from house this morning, the amazing view in the sky come into sight. I quickly grab my camera & capture this magnificent moment that would only last for few minutes. 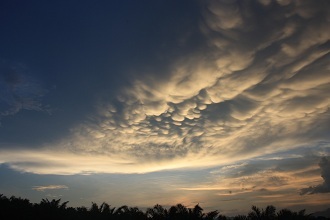 The shining clouds looked so unreal but it does appear right in front of me. It is hard to describe in words, but it takes my breath away. Nevertheless, this awesome scene fades so fast. 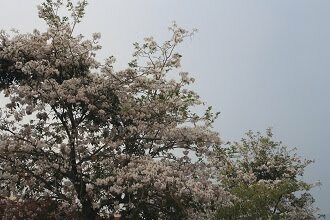 Before I could make few more photos capturing, it turns dimmed and soon the sky become silvery bright. Labu Sayong is a famous traditional water container made in clay that produced at Sayong, near the royal town of Perak, Kuala Kangsar. It is normally burnt to black that gives the ability to cool its content quickly. There are beautiful engraved patterns on Labu Sayong that makes it a unique & attractive handicraft product. 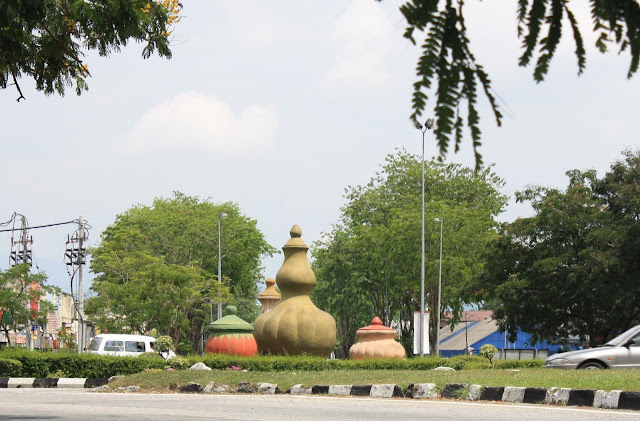 The authorities have put this giant sculpture of Labu Sayong (although not as beautiful as a real one) many years ago at the roundabout of Silibin Road & Jelapang Road conjunction as street decoration. This is also promoting the product which is pride of Perak. 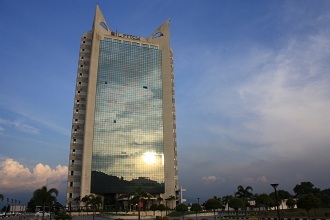 It even serves as a local landmark that guides visitors who are entering from Jelapang gateway towards city center. The name Rex is quite commonly used for cinema in towns throughout the country. Rex Cinema in Ipoh was a popular cinema in town that mainly showed Chinese movies. The front yard was a car park & also the place for some hawker stalls selling snacks & drinks. As the Beauty Supermarket was just next to Rex, and Majestic Cinema & Crescendo Supermarket was few minutes walking distance from here, this area used to be so happening, especially during weekend, where crowds were moving along Chamberlain Street for entertainment & food. Anyway, time changes everything. All the names mentioned above are no longer exist. These buildings are now occupied for other purposes. Looking at Rex in the sunset, I am emotional & miss those joyful old times so much. How hot is the weather? It is this hot where the couch grass in front of the factory is almost completely dried out & can be easily ignited by stub. With strong wind blowing, the fire is rapidly spread across the field & leaving ashes on its path. This is only one of many cases that happen everywhere in the city & yet only a small scale. There could be serious wild fire burning grass & tree where the thick smoke can be seen from miles away. Nowadays, competition among bridal shops is tough. Promotions & gifts are usually offered to attract customer. 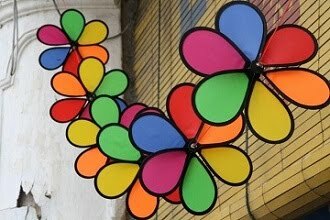 Some may also present creative ideas, such as special effect or special feature for uniqueness of photography. This is the Bliss Bridal at Ipoh Garden which is presenting an old Mini Coopers in front of the studio. Apart from using ancient luxury cars in bridal photography, which is commonly practiced by many bridal shops, simple & legendary car like this is simply a good idea as well. 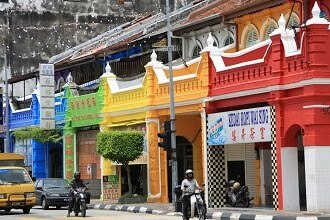 Apart from the Ipoh Railway Station, Town Hall & High Court, Perak State Mosque, Sultan Idris Shah II Mosque, is another significant building in Old Town. It covers an area of 2.6 hectares and believed to be the biggest mosque in the city. The mosque was completed in August 1968 and officially declared open by the late Sultan Idris Shah II on 15 November 1968. 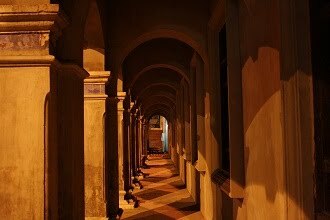 The completion of this mosque at that time simply marks the glorious era of Perak where mosque in great scale was not common throughout the nation. This is a cloudless afternoon. Everyone is trying to escape from exposing under the hot sun while the strong sunlight is forcing our eyes half shut. However, something is wrong on the street & annoying me; the street lights are on in the sunny afternoon. Are we having too much energy to spend? We are so grateful to live in this country which is full of natural resources. 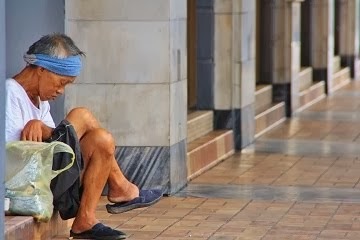 Nevertheless, many of us have used to consume resources without caring too much on wastage. 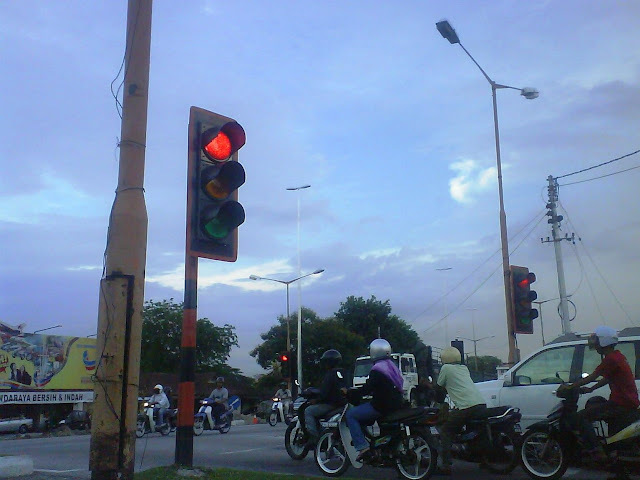 I often find street lights are turned on during daytime and normally it lasts for few days before someone could fix it. 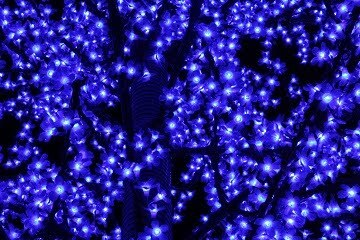 Even if the improper operating timing of lights has not used extra energy (same working duration in a day), it simply causes inconvenience to the people at night because the street will be covered in darkness. I hope the authorities will improve their efficiency in energy saving not only to cut down expenses in dollar, but also to minimize the consumption of resources. Monday is always a lazy day to work. 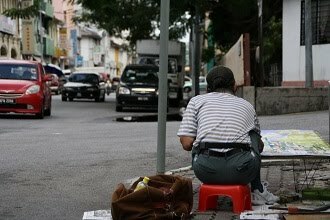 Without talking much, the working hour is over and many are released like a prisoner to enjoy the fresh air out there. The industrial estate remains peaceful in the sunset. 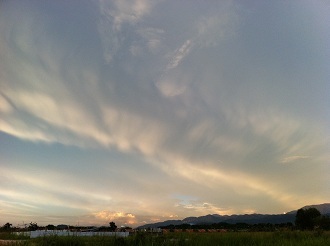 The white clouds yesterday afternoon had finally became rain clouds & brought the shower that cools the burning earth. The sky remains cloudy until this morning. So happen I wake up earlier than a normal Sunday, I have the chance to enjoy the cool & relaxing morning at Greentown that has no congestion & no crowd, but just refreshing breeze. Yesterday turned up to be a rainy day after being “baked” by the sun for weeks. Everybody tend to be so relief when the chain of hot days was finally broke up. 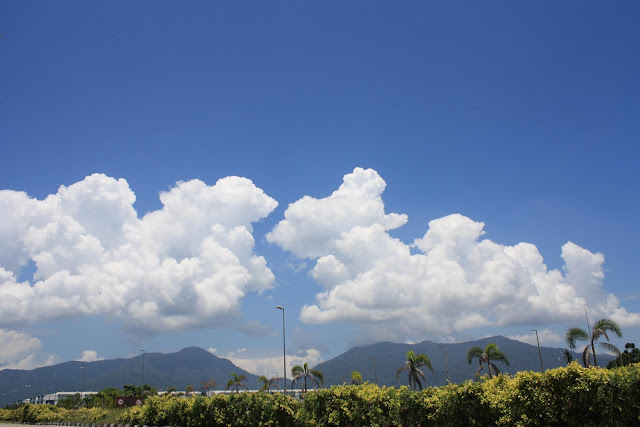 It is seen to have thick clouds again this afternoon and I can figure out the growth will probably make it a big rain clouds few hours later. Whoever passing by Ipoh on the North-South Expressway will find Tasek Cement a remarkable structure. 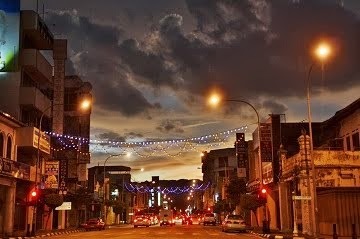 If we consider the height of buildings regardless of its functionality, this should be the tallest one in Ipoh. The factory, which was originally situated quite isolated, is now surrounded by residential units as the urban development is rapidly spread. 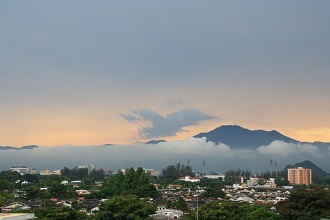 This photo is taken from the roof top car park of Kinta City Shopping Center that is only few kilometers away from the factory. In Malaysia, McDonald’s is usually a symbol of popularity of a commercial area. The first McDonald’s opened in Ipoh during mid 1980’s (again, I can’t recall which year exactly) at Cockman Street, the busiest & hottest commercial spot in the city center at that time. This fast food giant has chosen a beautiful prewar building that previously housed the Cold Storage. 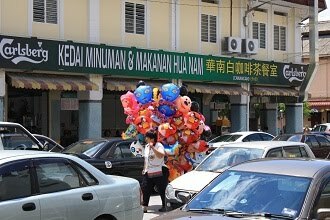 This famous supermarket, which locally called “freezer room”, was later retreated from Ipoh. The building was took over by other owner & once left vacant before McDonald’s move in to Ipoh. Nowadays, the night in this area has lost the crowd, but this restaurant marks the glorious past of Cockman Street. I find the clouds at this morning are a little different from normal days. It breaks into small lumps and when reflecting sunlight, it appears like metal flakes. Although this is not a breathtaking moment but I am just attracted by this scene which is rarely seen. Cave temple is a very unique scene of Ipoh. The city is surrounded by many lime stone hills & caves in these hills are isolated from the crowd that provide peaceful environment for temples. 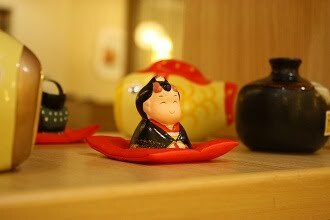 Apart from the few famous cave temples, there are also many others in smaller scale. This one is located at Tambun. One can easily see the temple on hill right in front of the sight after completely passing through the theme park Lost World of Tambun (Sunway City). 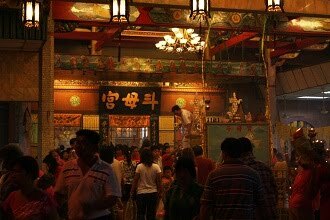 The temple is called Dong Hua Cave. I did not climb up to this temple but I think it should be fun & amazing to view the surrounding from higher spot. I was driving from Hospital Road towards Greentown this afternoon and suddenly found something different in sight. 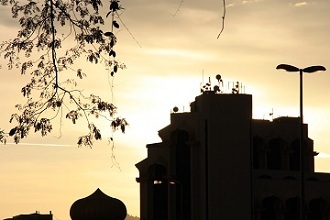 The great letters of “Majlis Bandaraya Ipoh” (means Ipoh City Council) appear on the roof of city council building. I could see the workers are still up there fixing the letters. Anyway, I have a question, is it wise & necessary to spend for putting up this thing rather than for improving services? The tower crane has drawn my attention when passing by Poi Lam School this afternoon. I made a turn into the construction site of Kinta Waterfront Hotel & Suites which is just behind the school. It seems like the project is progressing. The project owner, Morubina, is one of the famous properties developers in Ipoh. We start to get familiar with it by its chain of kindergartens (MMSB) around the city. 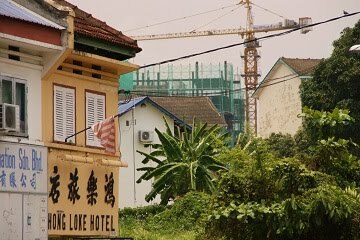 Later the company has completed some greater projects, such as the Hillcity Hotel & Condominium which accommodated the filming crew of famous Hollywood movie, “Anna and The King”. 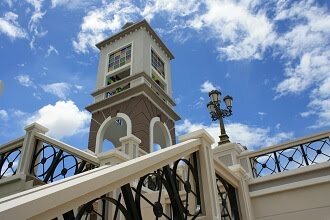 It gains better image with its accomplishment of a small scale shopping arcade, Pengkalan Emas Mall in Pengkalan, the Ipoh Kiara Condominium in Bercham & the Kinta Riverfront food arcade. As part of the whole riverfront project, this hotel & suites is probably the most iconic building and I believe the 20-storey building will change the city skyline. Morubina is promoting the slogan of “promise & complete”. Therefore, we shall expect the 5-star hotel opening within 1 or 2 years. This 7-storey building rose from ground near to the Casuarina Hotel last year. Many were wondering what it would be. Later during end of year 2009, the answer revealed. 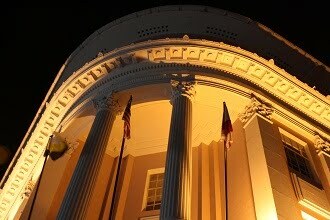 The building, namely Coliseum Square belongs to a famous restaurant throughout the nation. 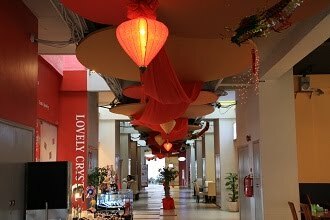 It comprises of several banquet halls & ballrooms at ground floor & 2 top most floor; floors in between are car park. 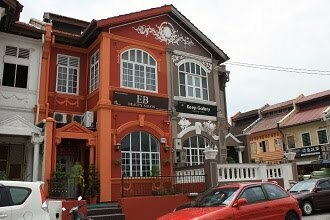 Although there are few well known restaurants in Ipoh has rose its standard & moved into larger stand alone buildings, but this is the first one occupying such a big building. Looks like the catering industry in this city has entered a new era & the competition is getting tougher. I am so lucky to be able to settle the overdue Ipoh City Council assessment tax during lunch time where the counter is normally not operating from 11:45am to 2:45pm on Friday. May be I am not that follow on the local news recently, I am not aware about the Mobile Counter that the city council is offering now. What draws my attention is the old truck which has been face-lifted for that purpose. This is not a usual practice of Malaysian government where we normally hear they always like to spend for new items. The age of this truck can be estimated base on a rough calculation from its number plate. The latest registered car at this moment will be assigned with initial alphabets AHB, and the truck is carrying AAQ (all motored-vehicle registered in Perak state have the initial “A”). If the alphabet is moving a step forward at every 2 months, the truck should be around 300 months old, which equals to 25 years old. Many of us, even originated from Ipoh, may not know this car park is the first multi storey car park in Malaysia. 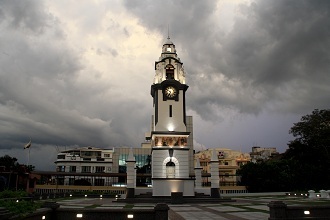 Built by the Ipoh Municipal Council during 1960’s-70’s (I couldn’t find the actual year of completion), the car park is just next to the Birch Memorial Clock Tower & OCBC Bank building (previously The Strait House); in front of the Public Bank headquarter of Ipoh. Although it is not something to be very proud of, but I am just wondering how many in the country aware about this fact & I believe most people guess would think the first one should be in Kuala Lumpur. 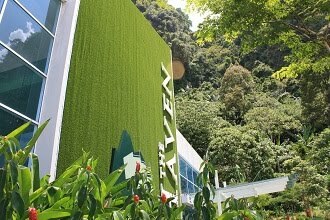 There are greens covering the east city center boundary where it locates the Royal Perak Golf Club, the Perak Turf Club, villas & luxury houses. 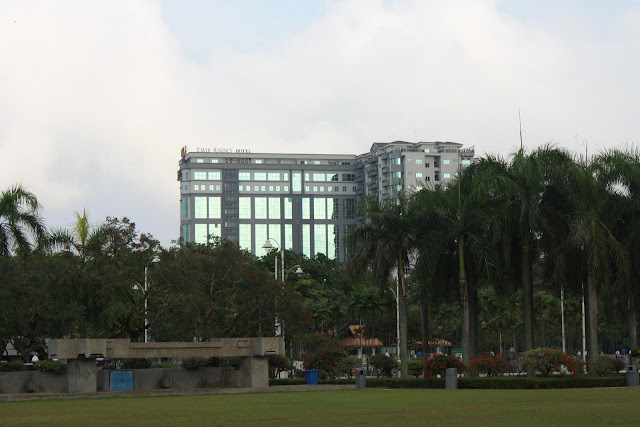 Prima Ipoh Condominium is seen as the two high rise buildings on the left while the Ipoh Specialist Hospital with the blue roofing stays next to it. 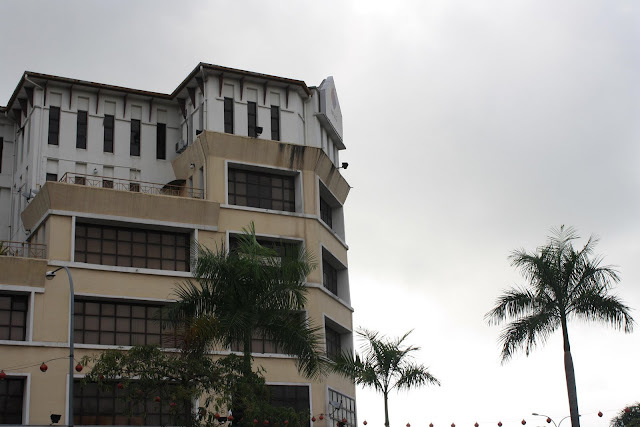 At the center, the square structure that appeared like an air traffic control tower is the Perak Turf Club landmark building. If I remember correctly it should be a broadcasting center. 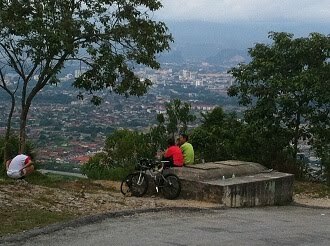 Behind these manmade structures, it is the beautiful landscape of mountains & hills, the Titiwangsa mountain range & lime stone hill of Gunung Rapat. I hope the city’s urban development will progress in harmony with the beautiful nature at surrounding so we could enjoy both the modern life & breathtaking natural view. It’s the end of working hour. Major roads start seeing more vehicles on their way home. Normally congestions happen on direction outwards from the city at Kuala Kangsar Road, Gopeng Road, Pasir Puteh Road & Tasek Road. Anyway, this would only last for a short while. 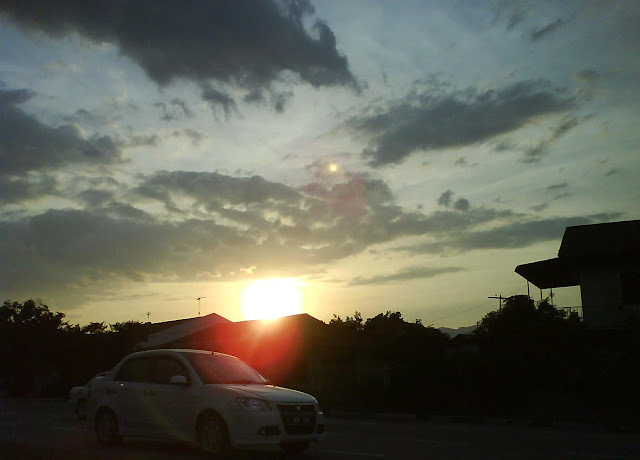 If one has no chance to enjoy the beauty of sun rise on the way to work, at least can stay relax to appreciate the peaceful sun set when on the way home. This site next to the inland port has been storage & refill station of gas tanks for many years. I remember there was an inferno occurred somewhere during 1990’s at a nearby chemical warehouse that lightened up the night sky of Ipoh. Those who could see the flame from surrounding areas thought the fire was burning at this gas station. Luckily it was not & the fire did not spread. The fire was successfully controlled without turning into a catastrophic incident. 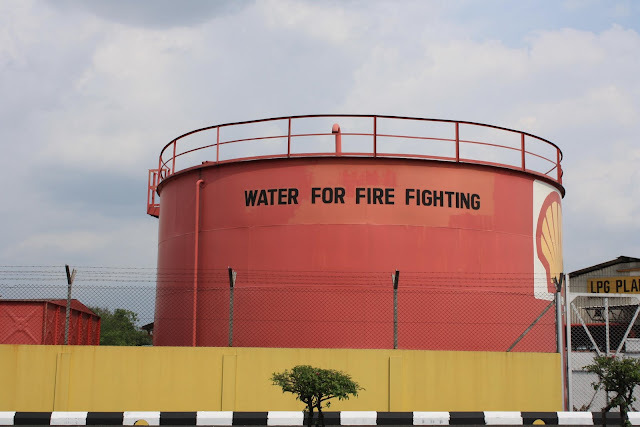 Soon after the case, I found this giant tank that closest to Maxwell Road is written with “Water for Fire Fighting”. I am wondering, since then, whether it means anything special.